A street-legal Indian Scout license plate frame takes your bike to the next level. 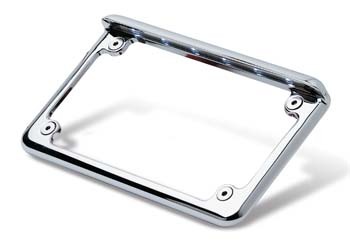 Radiantz is proud to offer an Indian motorcycle license plate frame that fits every biker's personality. Choose from yellow signals and bright-red brake lights. Our LED technology is unsurpassed in the industry. Our 20 years of experience show in our Indian Scout Bobber license plate holder with either a horizontal or vertical orientation. Trust in our manufacturing process and included warranty when you buy any Indian motorcycle license plate product. Your style and safety is our priority every day. Get familiar with our patented Z-Flex LED array that’s one of the brightest lights for your bike. The lights illuminate any side of your license plate frame. Free shipping on your $150 order or more is included when you try an Indian Scout Bobber license plate holder. The open road is waiting for the bold.